Ry Cooder has always been a musical storyteller, from his self-titled debut album (which featured both well-known and under-recognized folk, blues, swing, and jug tunes) to Boomer's Story, his last two offerings for Nonesuch (Chavez Ravine and My Name Is Buddy), and his many film scores (including those for The Long Riders, Paris, Texas, Last Man Standing, Geronimo, and The End of Violence, just to mention a few). When his contributions as a musicologist, producer, and collaborator -- such as his contributions to the various Buena Vista Social Club recordings (including the film score) and his work with V.M. Bhatt, Pops Staples, Ersi Arvizu, and guitarist Manuel Galbán of Los Zafiros -- are included, he becomes a genuine mythmaker. I, Flathead contributes to the weight of Cooder's legend in many ways. First, there's the title, an obvious nod to the late Isaac Asimov's I, Robot; then there's the legend -- the entire story is told in a 100-page, hardbound novella that accompanies the Deluxe Edition -- about beatnik, country music nut, and salt-flats racer Kash Buk, his band the Klowns, the strange and wonderful extraterrestrial visitor called Shakey, and the Passenger who pursues him. It's even subtitled "The Songs of Kash Buk and the Klowns." Finally, there's the music; it's a set of 14 original tunes that employ everything from country rockabilly to blues; strange, shimmering exotica; and Latin-influenced rock, swing, and mariachi music. Thanks for your kindness in posting the Ry album. I've never seen it but I can't wait to listen to one of my favorite musicologists of them all. Have a great day. 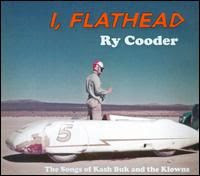 This, and Ry Cooder's previous 2 albums, are the best he has ever made. I strongly recommned you buy them, this one in particular as it comes with a whole book that is a real part of the package, not just a useless extra.